Yorkshire Supervisors Forum has been going now for 12 years. 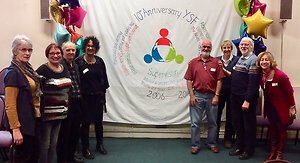 We are a voluntary organisation and a forum for Yorkshire supervisors of counsellors and psychotherapists. We are based in Yorkshire and we meet three times a year either in Leeds or York to provide training workshops, support and opportunities for reflection on our supervision practice. To our knowledge we are the only group of supervisors like this in the UK, being very much a grassroots group. We are a peer led networking group, completely voluntary and non-profit making and we depend on the generosity of the group to offer their time free of charge to organise events or to run them. We have a small committee which discusses and makes decisions about our programme. Our members come from a wide variety of modalities and supervise counsellors and psychotherapists in a wide range of settings. Each meeting consists of a workshop, followed by lunch where we can all network. Sometimes workshops are led by forum members, and sometimes we call on outside speakers. For a flavour of the workshops and topics that we have provided in the past in our forum then please click on "past events" on the menu bar and you will see that our workshops have a variety of subjects around areas of interest to supervisors in counselling and psychotherapy. We hold meetings within walking distance of either Leeds or York stations, so the locations are easily accessible. Yorkshire is a large county and we do have members from all over so access is an issue we take seriously. Events run from 10-1pm, followed by lunch. An important part of the day is networking with other supervisors, which can be especially valued by those of us who work in private supervision practice or who are otherwise isolated in their organisational working practice. The membership fee for the Yorkshire Supervisors’ Forum is £20 per year and our workshops cost £20 for members of the Forum and £35 for non-members. This fee is for the three-hour training session and lunch. The time counts toward CPD hours and we will provide you with an attendance certificate. If you are a counsellor or psychotherapist and also a supervisor, we would love to meet you. You are also welcome if you are on a supervision training course. Please contact us via this website to be put on our mailing list and you will be automatically informed of the next meeting. If you would just like more information, please contact us via the web site. The current members have all found many benefits of being part of the Forum and we invite you to come along and experience this for yourself. Looking forward to meeting you at our next meeting. If anyone has any ideas for future topics, within a supervision context, that they would like to deliver, or knows of anyone who presents CPD from a supervision perspective, then please feel free to drop us a line. We are always open to new ideas, members and topics. Cost: £35.00 for non-members. Members’ Concessionary Fee £20: lunch is included. For a booking form, please get in touch via the email facility in this website or email [email protected] The booking form needs to be completed and returned to the booking secretary along with the payment. Details are on the form. Payment can be made either by cheque or by on-line banking. Cheques should be made payable to Yorkshire Supervisors’ Forum. For on-line banking please transfer the full fee to Yorkshire Supervisors Forum, Sort code 40-27-15, account no 44254856. Please add your name and the reason for the payment as the reference. Finally, please note that by filling in the booking form, you accept our terms and conditions. You can cancel your booking and receive a FULL refund any time up to 30 days before the event. After that, NO refund is possible and the full fee will be retained. This is because we have already committed to booking the accommodation and food for the event and are unable ourselves to change our financial obligations. Thank you. It looks as if all private psychotherapists, counsellors and supervisors will have to register from May 2018. Further information is available from the ico.org.uk website . Our recent event in February in Leeds proved to be a popular and interesting one, covering presence and absence in supervision. Thanks to Steve Page for such an interesting and informative workshop. We were delighted and honoured to welcome Steve to speak about “Presence and Absence in Supervision”. Steve is a coach, counsellor, supervisor and sculptor He has a private practice in Sheriff Hutton, North Yorkshire. His forty-year career has spanned therapeutic communities, private practice and higher education, with a thread of supervision running throughout. His therapeutic orientation has its roots in humanistic and psychodynamic traditions. · What attachment dynamics are aroused in us and in our supervisee whenever we welcome them for a session? · How do we regulate our own fear system whilst hearing of our supervisees’ difficulties and dilemmas? · What impact does the location and nature of our supervision space have on us, our supervisees, and the quality of the work we do together? · How do we best promote the well-being of our supervisees? We meet in either Leeds or York town centres within easy reach of the train stations.